Eva Soni’s baby is a little different. At 3 1/2 months, her baby is already crawling, climbing, and doing pull-ups. Instead of gentle tickling and soft cooing, Eva’s baby enjoys biting. Like most infants, Eva’s enjoys affection and naps, but that won’t stop her from attacking Eva’s face—because Eva’s baby is a gorilla. Born on July 17th, the newest addition to the San Francisco Zoo’s western lowland gorilla troop has allowed lead gorilla keeper Eva Soni to experience a whole new kind of motherhood. When the zoo decided to hand-rear the gorilla baby because it became clear that her mother could not care for her, Eva eagerly assumed the role of temporary gorilla mama. 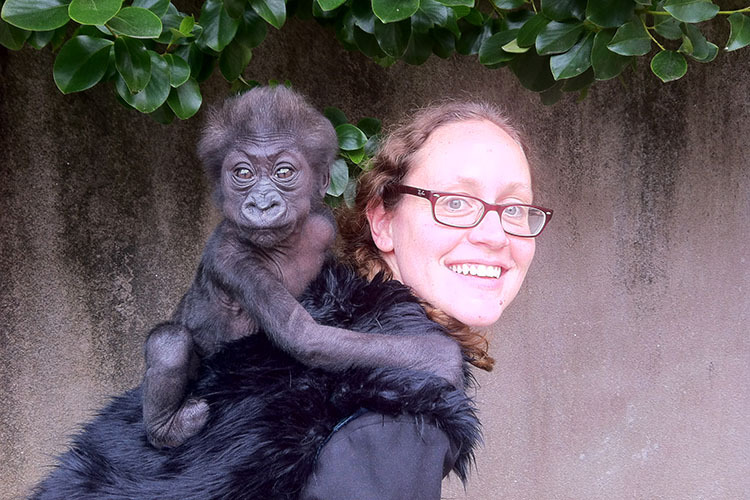 Until the infant can be given to a surrogate gorilla and rejoin the rest of the troop, Eva cares for the baby, spending 12-hour days living in the zoo’s gorilla building with the baby gorilla clinging to her faux gorilla shirt. “The first few weeks were exactly like taking care of a newborn human: all they do is eat, sleep, eat, sleep—so you’re just kinda sitting there, feeding her a bottle every hour,” Eva said. Eva and the unnamed baby spend their days safely separated from the adult gorillas in one of the rooms of the cavernous gorilla building, but allow the adults access to adjoining areas to visit the baby through the dividing mesh. Eva says this allows the baby to observe gorilla behavior and bond with her relatives. “We live in the gorilla house—we want her to be a gorilla,” she said. Despite ample interactions with her gorilla family, the baby currently spends all of her time being cared for by humans, so for the baby to acquire gorilla traits, Eva has to behave like a gorilla as well. “We try to be a gorilla as much as we can, so we carry her around on our backs with that fuzzy shirt—that’s to help keep those muscles strong and developing, so when we hand her over to the other gorillas, she’s going to know exactly what to do. We get down on all fours and crawl around, we do back rides, we kinda cup her in our hands and throw her around a little bit—we want her to be like the other gorillas, and they’re not too gentle,” Eva said. Another responsibility of human-gorilla motherhood is training the baby to feed from bottles, which she will need for up to 3 years—though less frequently than she does now. Since her grandmother Bawang (who will be acting as the baby’s surrogate) is no longer making milk, the baby will require assistance in receiving proper nutrition. Once the baby is introduced to the rest of the troop, Eva and the other keepers will be able to tap on the bottle from outside the mesh, signaling dinner time for the baby. Fortunately for Eva, the baby is a fast learner, already recognizing the training cues and crawling over to accept her bottles. Eva hopes that soon the baby can begin her first full-contact introductions with Bawang and over time, to the rest of the gorillas as well. And while Eva will eventually go back to her normal schedule of gorilla care, she knows she will always be kindred. “I’m definitely a part of their family—I feel that. They’re excited to see me,” Eva said. Eva’s days as gorilla momma may be limited, but she ‘s eager to watch her little lady bond and grow with her gorilla family, especially with her half-brother Hasani, who Eva says is eager to play with her. And while she admits separating herself from the baby gorilla will be hard, Eva is confident in grandma Bawang’s ability to be an amazing surrogate mom, and in the troop’s desire to be a loving family. To lean more about the zoo’s efforts to help save endangered western lowland gorillas, follow the baby gorilla’s development, or to participate in the upcoming naming contest, please visit the San Francisco Zoo’s website, or follow them on Facebook. Author’s note: All photos are courtesy of Eva Soni. What a beautiful heartfelt story. Eva is so lucky & privileged to be having this wonderful once in a lifetime experience. Thank you Eva, for your caring intervention to help this little guy make it through infant-hood. May he continue to thrive, be healthy and become a mature silverback some day. Thank you. This is a wonderful story. I’m so happy to learn that this baby will be saved and is slowly getting to know its relatives. Sometimes animals reject their young and when we can intervene in a positive way and help save a life, that is a gorgeous and inspiring thing. Bravo on a well written story! Love it. I remember lingering far too long in the gorilla den at the Washington D.C. zoo. 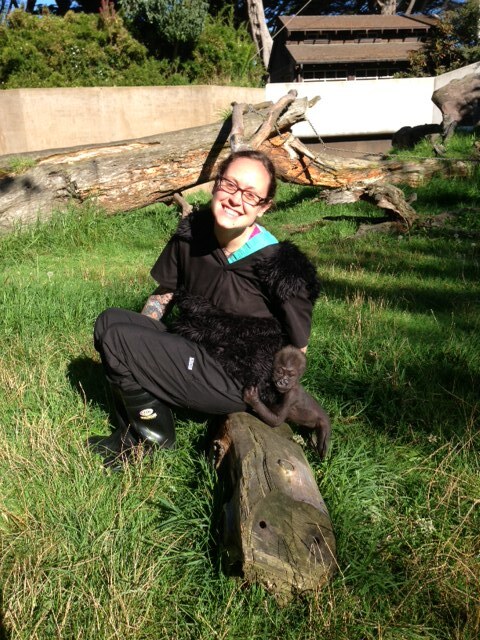 A baby female gorilla was the most incredible scamp in the place.